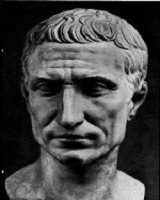 Julius Caesar July 100 BC March 15, 44 BC Roman Gaius Julius Caesar Aurelia Cotta Politician, Author The most famous Roman of them all, he conquered Gaul in a brilliant campaign which is still used in studies for training generals today. His victories in Gaul brought into the empire what should later become one of the most important new territories to the empire. A list of popular julius caesar quotes are given below.